Water-free urinal through three aspects to avoid water, and no odor. Get green save water and the enviroment. The body of urinal is made of special ceramics in the condition of 1280°C with Silver nanometer class anti-soil and bacterial-proof technology on its surface. The high surface density and finish made it difficult for urine to remain with odor eliminated. The water absorption of ceramic surface is as 1/20 as the general others. It is just like the lotus. When the urine drops into the urinal body, it will flow into the drainage pipe directly without remains. Because of urinal ceramic surface high density with a fine layer of nanometer structure, it is difficult for urine to remain with odor eliminated and surface protection. The unique of inherent stress between the ceramics and stainless steel connector make it difficult for urine or dust to remain or from scales so the odor eliminated . For fresh urine contains no bacteria,no strong smell,The reason why urine has odor is because urine will combine with water after a few minutes, which is then destroyed by bacteria,generating urease, urease accelerating decomposition of urine,Make weak acidity urine gradually become alkalescent,While exhalation alkaline undissolved compounds(stains and scales),decompose Ammonia smell,namely urine stink. 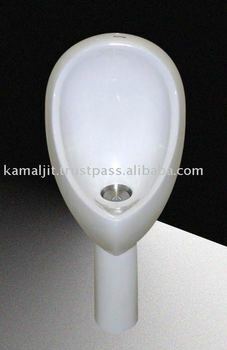 First,sunming water-free urinal Surface of the special glazed materials absolutely inhibited bacteria.Ssecondly,Surface of the urinal only have trace urine,trace urine will soon evaporate without bacteria,that is to say, trace urine evaporate before the stink generated ,so it won't affect toilet environment. The odor isolating device is applied with the national patent technology,NEOFLON-TM FEP Resin have the characteristic of anti-aging,high temperature resistant,hydrophobic. Urinal trap is applied on the mechanical principle with high sensitivity,Airproof baffle can open and close under the draught head outside and inside and its own gravity when urine runs through the waterless trap. The airproof baffle makes good leak tightness by its own gravity. So the odor of pipe line was cut off absolutely.